Whatever happened to those hard rock & roll stars of the '60s. Remember those raunchy, rebel rockers, dressed in body shirts, tight bell-bottoms, shrunken leather jackets and black pointed boots, with their long, tangled hair tossing to and fro as they crouched low to the ground trying to bend yet another lead note from their blasting guitars, maybe even remember the defiiantly held cigarette from their mouths long enough to pick a few notes with their front teeth. Rock & roll stars have mellowed considerably over the years. These days the musicians have cleaned up their acts. The Liverpool look has been replaced by a western fashion, cavorting has been replaced by a layed-back stage presence and most lead riffs are now played smoothly on acoustic or pedal-steel guitars. Yes, those '60s rockers are a dying breed, almost. There's at least one guy around who is carrying the rocker's cross, crusading for the music of a decade past, straining against the winds of change. His name is Tommy Petty. If that name rings a bell, don't be surprised, because if you were in Gainesville during the late 60's and early 70's you've probably heard of Tommy Petty. Tommy was the leader of the rock group Mudcrutch, perhaps Gainesville's most famous hometown band. 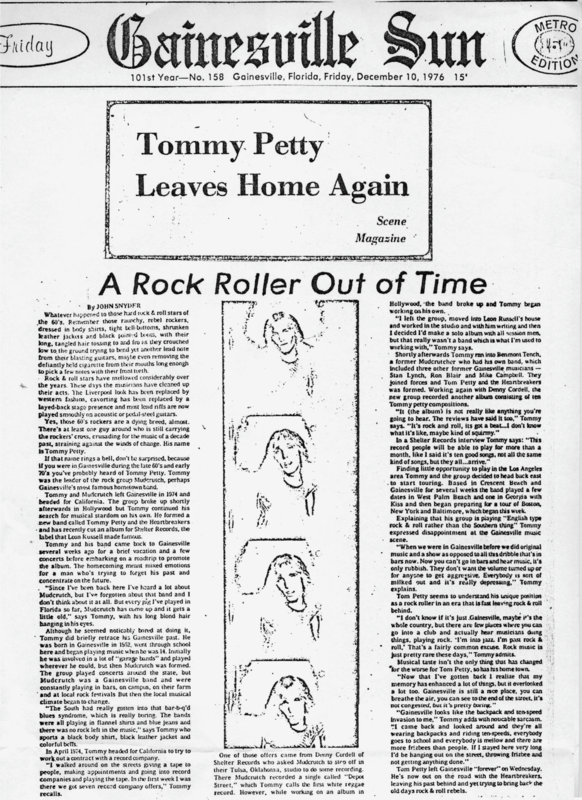 Tommy and Mudcrutch left Gainesville in 1974 and headed for California. The group broke up shortly afterwards in Hollywood but Tommy continued his search for musical stardom of his own. He formed a new band called Tommy Petty and the Heartbreakers and has recently cut an album for Shelter Records, the label that Leon Russell made famous. Tommy and his band came back to Gainesville several weeks ago for a brief vacation and a few concerts before embarking on a roadtrip ro promote the album. The homecoming meant mixed emotions for a man who's trying to forget his past and concentrate on the future. "Since I've been back here I've heard a lot about Mudcrutch, but I've forgotten about that band and I don't think about it at all. But every gig I've played in Florida so far, Mudcrutch has come up and it gets a little old," says Tommy, with his long blond hair hanging in his eyes. Although he seemed noticably bored at doing it, Tommy did briefly retrace his Gainesville past. he was born in Gainesville in 1952, went through school here and began playing music when he was 14. Initially he was involved in a lot of "garage bands" and played wherever he could, but when Mudcrutch was wormed. The group played concerts around the state, but Mudcrutch was a Gainesville band and were constantly playing in bars, on campus, on their farm and at local rock festivals. But then the local musical climate began to change. "The South had really gotten into that bar-b-q'd blues syndrome, which is really boring. The bands were all playing in flannel shirts and blue jeans and there was no rock left in the music," says Tommy who sports a black body shirt, black leather jacket and colorful belts. 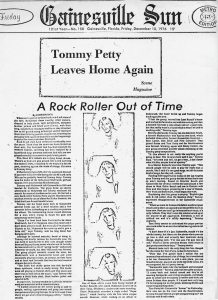 In April 1974, Tommy headed for California to try to work out a contract with a record company. "I walked around on the streets giving a tape to people, making appointments and going into record companies and playing the tape. In the first week I was there we got seven record company offers," Tommy recalls. One of those offers came from Denny Cordell of Shelter Records who asked Mudcrutch to step off in their Tulsa, Oklahoma, studio to do some recording. There Mudcrutch recorded a single called "Depot Street," which Tommy calls the first white reggae record. However, while working on an album in Hollywood, the band broke up and Tommy began working on his own. "I left the group, moved into Leon Russell's house and worked in the studio and with him writing and then I decided I'd make a solo album with all session men, but that really wasn't a band which is what I'm used to working with," Tommy says. Shortly afterwards Tommy ran into Benmont Tench, a former Mudcrutcher who had his own band, which included three other former Gainesville musicians -- Stan Lynch, Ron Blair and Mike Campbell. They joined forces and Tom Petty and the Heartbreakers was formed. Working again with Denny Cordell, the new group recorded another album consisting of ten Tommy Petty compositions. "It (the album) is not really like anything you're going to hear. The reviews have said it too," Tommy says. "It's rock and roll, it's got a beat ... I don't know what it's like, maybe kind of squirmy." In a Shelter Records interview Tommy says: "This record people will be able to play for more than a month, like I said it's ten good songs, not all the same kind of songs, but they all...arrive." Finding little opportunity to play in the Los Angeles area Tommy and the group decided to head back east to start touring. Based in Crescent Beach and Gainesville for several weeks the band played a few dates in West Palm Beach and one in Georgia with Kiss and then began preparing for a tour of Boston, New York and Baltimore, which began this week. Explaining that his group is playing "English type rock & roll rather than the Southern thing" Tommy expressed disappointment at the Gainesville music scene. "When we were in Gainesville before we did original music and a show as opposed to all this dribble that's in bars now. Now you can't go in bars and hear music, it's only rubbish. They don't want the volume turned up or for anyone to get aggressive. Everybody is sort of milked out and it's really depressing," Tommy explains. Tom Petty seems to understand his unique position as a rocker roller in an era that is fast leaving rock & roll behind. "I don't know if it's just Gainesville, maybe it's the whole country, but there are few places where you can go into a club and actually hear musiicans doing things, playing rock. 'I'm into jazz, I'm past rock & roll.' That's a fairly common excuse. Rock music is just pretty rare these days," Tommy admits. Musical taste isn't the only thing that has changed for the worse for Tom Petty, so has his home town. "Now that I've gotten back I realize that my memory has enhanced a lot of things, but it overlooked a lot too. Gainesville is still a nice place, you can breathe the air, you can see to the end of the street, it's not congested, but it's pretty boring." "Gainesville looks like the backpack and ten-speed invasion to me," Tommy adds with notable sarcasm. "I came back and looked around and they're all wearing backpacks and riding ten-speeds, everybody goes to school and everybody is mellow and there are more frisbees than people. If I stayed here very long I'd be hanging out on the street, throwing frisbee and not getting anything done." Tom Petty left Gainesville "forever" on Wednesday. He's now out on the road with the Heartbreakers, laving his past behind and yet trying to bring back the old days rock & roll rebels.